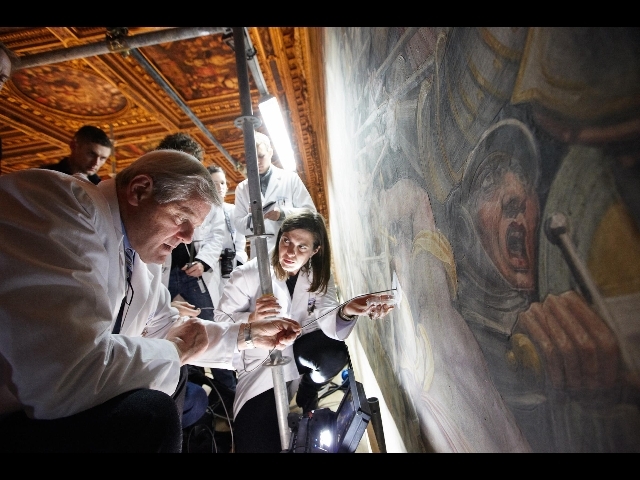 The hectic search of Leonardo’s lost masterwork “The Battle of Anghiari” has been going on for many years. The site is the Salone dei Cinquecento in Palazzo Vecchio, Florence. 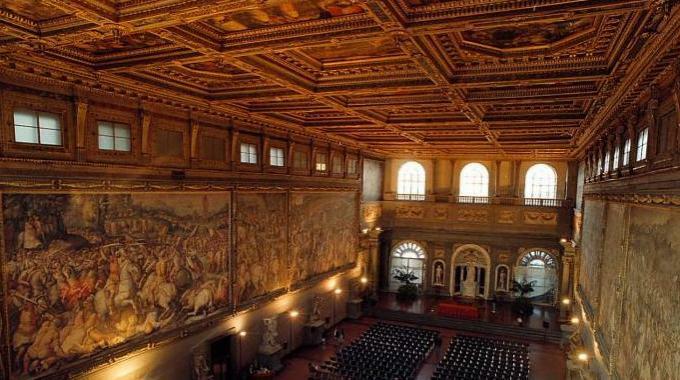 The story started in 1563 when Vasari, commissioned to renovate the hall with a large fresco, featuring the Battle of Marciano, might have preserved the work of Leonardo, hiding it under a juxtaposed new wall . On top of Vasari’s battle, 12 meters above the ground, a soldier waves a green flag with the following written words ” Chi cerca trova” (“He who seeks, finds”). 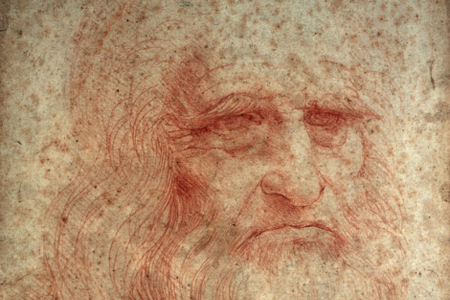 Could these obscure words be hinting at Leonardo’s fresco ? Leonardo was commissioned the Battle of Anghiari by the gonfaloniere Pier Soderini to proudly celebrate the victory of the Florentine troops against Milan in 1440. The work, dating back to 1503, was never completed, Leonardo abandoned the project because of technical difficulties. Many preparatory studies of Leonardo’s work still exist. The size of the Battle of Anghiari was impressive. Meant to deal with the various moments of the battle, Leonardo focused mostly on the scene representing colliding horses and cavaliers. Its central section about four cavaliers, fighting for a standard, is best known through a drawing by Peter Paul Rubens , at the Louvre, Paris, known as The Battle of the Standard, based on an engraving of 1553 by Lorenzo Zacchia. Rubens succeeded in portraying the detailed dramatic movements, presumably present in Leonardo’s original painting. Maurizio Seracini, professor at San Diego University, California, has, at present, been following his dream for many years, chasing after the Renaissance masterwork, hidden, according to him, behind Vasari’s fresco. The professor, a highly technological engineer, in the survey of the area, has implemented non-invasive techniques, such as a high-frequency, surface-penetrating radar and a thermographic camera. He found a gap between the two walls, large enough for the older fresco to be preserved. Through an endoscopic camera probe the team discovered fragments of pigment on the plaster of the inner wall, an evidence of Leonardo’s fresco wall, being their chemical composition similar to black pigment of Mona Lisa and St. John the Baptist in the Louvre, Paris, as from recently published scientific papers by the French museum. Recently, on March the 12th, 2012 Seracini publicly announced the evidences, however still controversial. The challenge is still going on.